The Arctic has warmed more than any other part of the planet in the past 30 years. (Image Credit: Andrei Taranchenko). North of the Arctic Circle, extraordinary weather has become ordinary. At the start of 2016, temperatures at the North Pole crept above freezing, 16 degrees Fahrenheit above average for January. In 2015, sparse snowfall forced organizers of the Iditarod, Alaska’s annual sled dog race, to relocate the event, and in 2016 they had to transport snow from Fairbanks to Anchorage to cover the bare racetrack. In July 2016, temperatures in the Arctic town of Deadhorse hit 85 degrees Fahrenheit, the highest temperature ever recorded anywhere within 50 miles of the Arctic Ocean. The Arctic has warmed more than any other part of the planet in the past 30 years. Driven by global climate change, this warming has driven widespread melting of sea ice, glaciers, and permafrost. These dramatic environmental fluctuations indicate that climate change is a current threat, not just a problem for future generations. They also foreshadow the magnitude of the impacts of climate change on the United States in the coming decades. Climate change and El Niño may be causing Arctic weather patterns to change in ways that indirectly alter weather patterns at lower latitudes. For example, scientists are concerned that a shrinking temperature gradient between the tropics and the rapidly warming Arctic will alter two important atmospheric currents: the jet stream and the polar vortex. As a strong mid-latitude current, the jet stream dictates weather conditions for much of the continental United States. 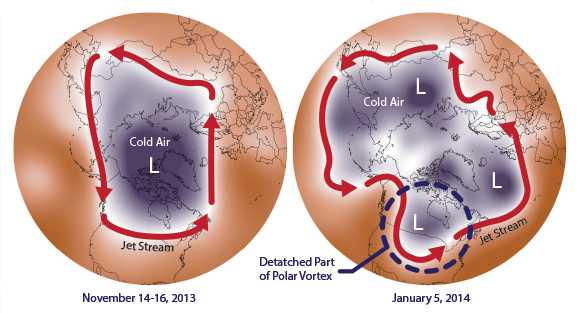 Further north, the swirling motion of the polar vortex helps to keep frigid air isolated at higher latitudes. When the typically strong temperature gradient between the equator and the poles diminishes, the jet stream and polar vortex become increasingly unstable. This instability allows tropical air to penetrate the Arctic while polar air infiltrates lower latitudes. Increasingly erratic weather patterns in the Arctic have allowed subfreezing temperatures to infiltrate lower latitudes. A strong jet stream (left) traps polar air within the Arctic Circle. When the jet stream weakens (right), polar air reaches lower latitudes. (Image Credit: NASA). These atmospheric shifts are partially to blame for the bursts of Arctic weather that impacted the eastern half of the continental United States during the winter months from 2014 to 2016. While Alaska experienced record breaking heat, the polar vortex brought a deep freeze from Boston to Chicago, where wind chills dragged temperatures down to a record low of -20 and -42 degrees Fahrenheit respectively in 2014. Record-breaking cold extended as far south as Florida in 2014 and 2015, affecting an estimated 200 million people. Dangerously cold temperatures impacted the regional economy by shuttering schools and offices, disrupting flights, inflating heating bills, and damaging infrastructure. Alaskan weather patterns impact not only temperature, but also rainfall. California’s historic drought has been linked to a stubborn area of high pressure parked over the Gulf of Alaska. Known as the “Ridiculously Resilient Ridge,” this pressure system blocks stormy weather that would otherwise replenish the alpine snowpack and parched soil in the Golden State. While historic rainfall recently brought an end to the five year drought, the extended period of dry conditions depleted groundwater, exacerbated wildfires, and damaged the environment. In 2015 alone, the California drought caused $2.7 billion in economic losses and impacted 21,000 jobs, mainly in the agriculture sector. Beyond subfreezing temperatures and drought, the increased prevalence of billion dollar disasters further illustrates the need for preparedness and adaptability in a time of climactic uncertainty. As these changes drastically alter the Arctic environment, they carry far reaching implications for the health, safety, and prosperity of our entire nation. (Left) St. Joseph Lighthouse on Lake Michigan encased in ice following a dip in the polar vortex. (Right) A NOAA image from the High Resolution Rapid Refresh model illustrates the deep southward extent of the polar vortex in 2014. Blue shading indicates temperatures below freezing. (Image Credits: left, Kamil Dziedzina; right, NOAA).